Have a question about Raw Cacao Brazil Bliss Spread? What is it, what does it do, how and when to use or something else? Ask us. 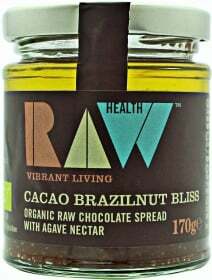 WARNINGS Raw Cacao Brazil Bliss Spread : Please note: oil separation occurs naturally, simply stir to restore creamy consistency. Store in a cool, dry place.